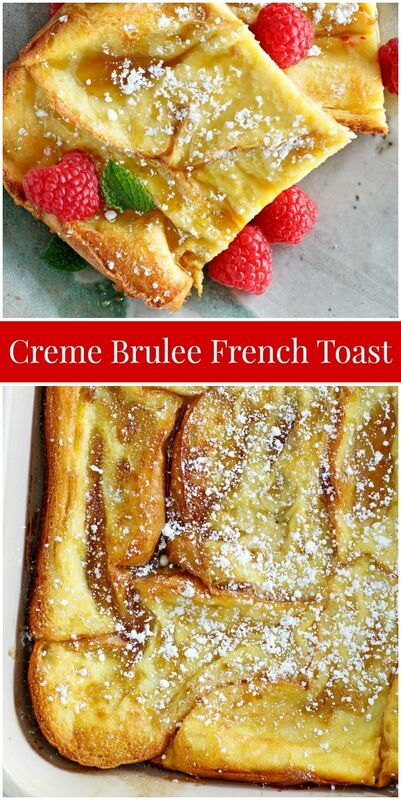 Creme Brulee French Toast is just about the most decadent and delicious overnight French Toast Casserole recipe there is! 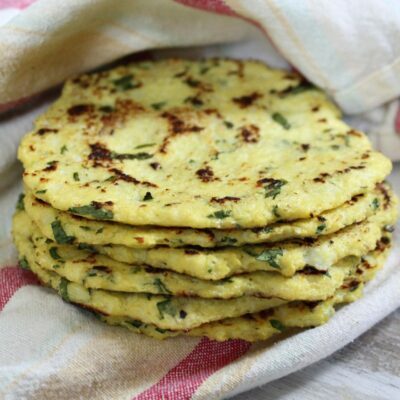 It’s definitely a must-try recipe for the holidays or for a special weekend breakfast or brunch. 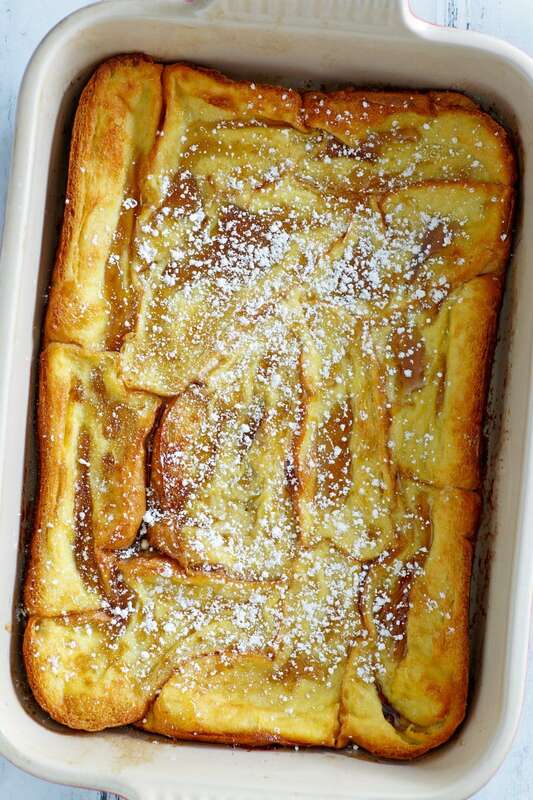 What makes this French Toast Creme Brulee? In the traditional Creme Brulee dessert, a vanilla custard is topped with a layer of hardened caramelized sugar. So this Creme Brulee French Toast has some of those elements. French bread is soaked in a rich egg/cream mixture, which becomes so soft and tender after an overnight soak. So that relates to the custard layer. Underneath all of that bread is a sugary caramel layer. The bread soaks up that as well. It all equates to the amazing flavors in classic Creme Brulee. What kind of pan do you need to make this recipe? 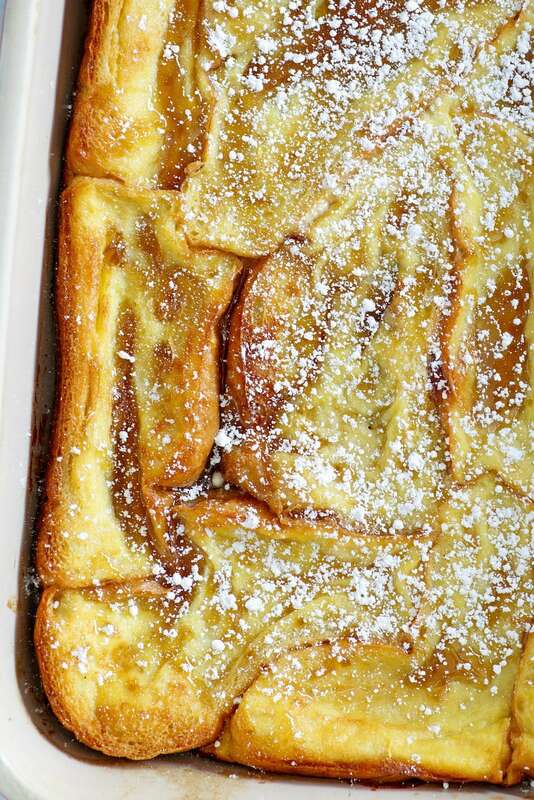 You’ll use a 9×13-inch baking dish to make Creme Brulee French Toast. You can use any 9×13-inch dish, but if you’re serving it up as something special then it’s nice to use a nice dish! I recommend this Emile Henry 9×13-inch rectangular baker. It’s pricey, so ignore if you don’t want to spend money on a new dish. But I love that it comes in different colors. I have a white one and a red one. They’re so pretty! Make the caramel mixture: melt together butter, brown sugar and corn syrup. Then scrape that caramel mixture into the dish, and tilt the dish around to make sure the caramel mixture covers the bottom of the dish. Next the bread slices are placed into the bottom of the dish. They won’t fit neatly, so you’ll just squish all of the bread slices into the bottom of the pan in an unruly manner! Next comes the egg and cream mixture. You’ll whisk together eggs, half and half cream, vanilla, Grand Marnier, and salt. Then that mixture is poured over the bread in the casserole dish. Plastic wrap covers the dish and is pressed onto the bread. I like to add a book on top of the plastic wrap to make sure that bread is staying down and really having a chance to soak up everything. It’s refrigerated overnight, and then it’s baked in the morning. 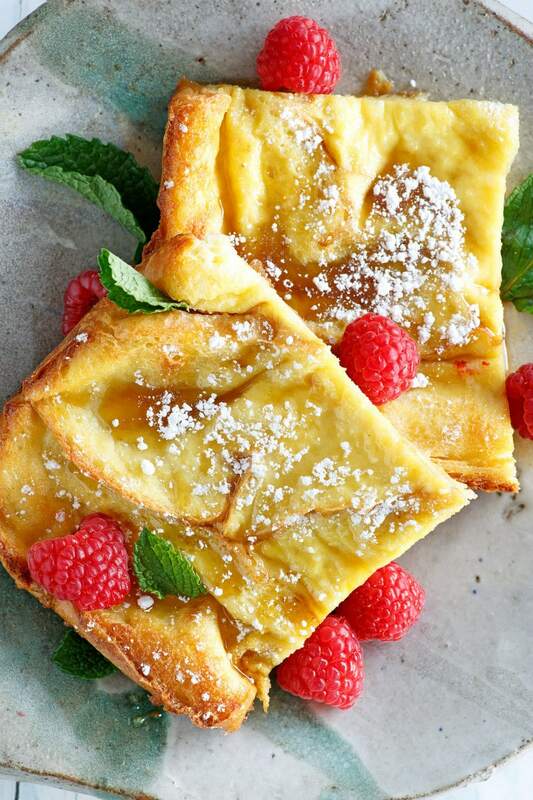 Do you have to prepare this French toast the night before? 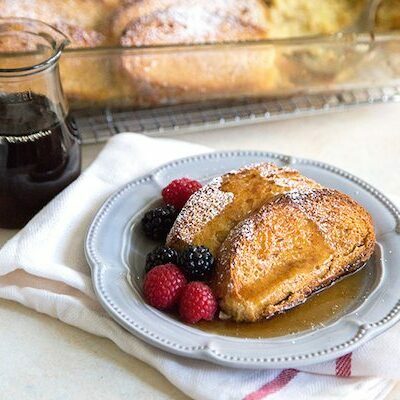 Creme Brulee French Toast is best when you can let it sit overnight in the refrigerator. It really needs time to soak up all of the caramel and milk/egg mixture to make it as fabulous as can be! 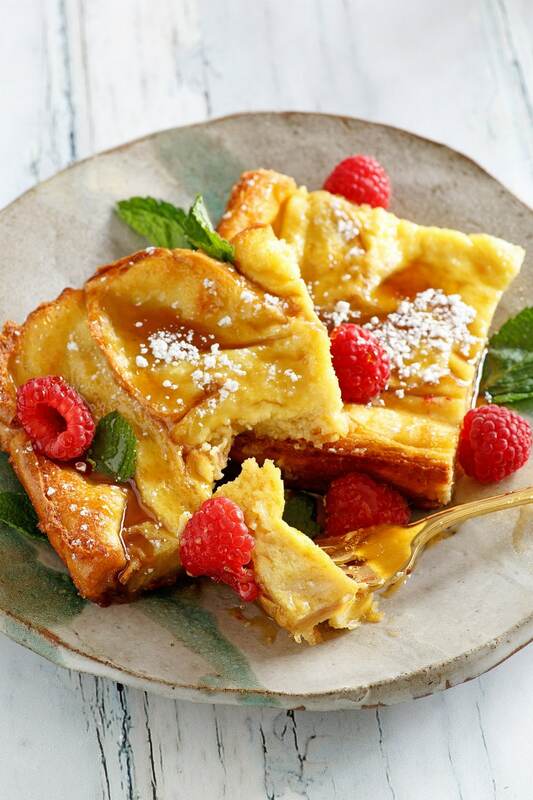 What are the best garnishes and toppings for Creme Brulee French Toast? 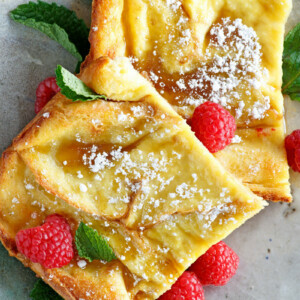 This French toast is fabulous on its own. As you scoop slices out of the pan, you’ll see that there are a ton of sugary juices left in the casserole dish. Spoon those sugary juices out, and drizzle it over the individual servings. You can also lightly sprinkle each serving with powdered sugar. And it’s nice to provide some warm syrup since some people prefer syrup on their French toast! Oh, and if you want to be really fancy then you can add some fresh mint leaves for garnish. 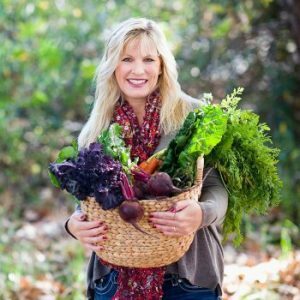 If you’re looking for more main dish breakfast recipes for a special breakfast, you might consider trying my Spiced Apple Waffles or this Farmer’s Casserole. 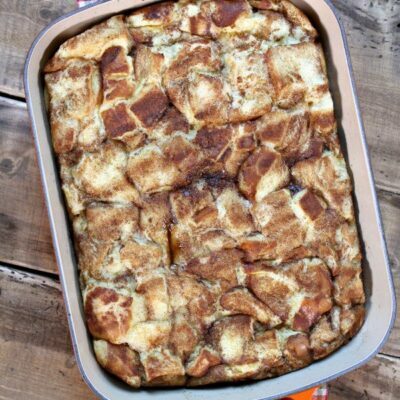 Brunch Enchiladas, Holiday Breakfast Casserole, and Bundt Pan Bacon Egg and Cheese Brunch Bread are good choices too. 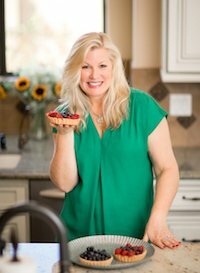 If you’re looking for some good breakfast side dishes for a special breakfast, I really love my Basil- Lime Fruit Salad or these Copycat Starbucks Vanilla Bean Scones. Cranberry Mimosas are s a nice holiday beverage recipe too! 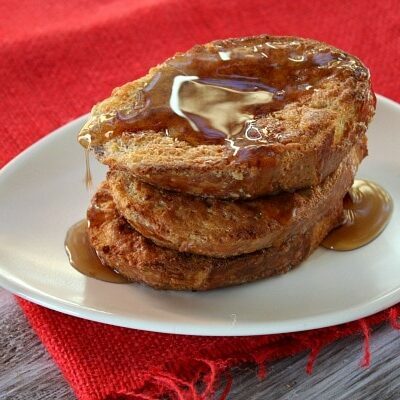 Totally delicious overnight french toast recipe! In a medium saucepan, heat the brown sugar, butter and corn syrup over medium heat until well blended, stirring frequently. Pour the syrup into a 9x13-inch baking dish, tilting the dish to cover. Arrange the bread slices in a single layer over the syrup. Just squish the bread pieces in so that they all fit in there. There should be an even layer of bread slices that cover the bottom of the pan. In a medium bowl, whisk the half and half, eggs, vanilla, liqueur and salt until well blended. Pour over the bread layer. Cover with plastic wrap, press the plastic wrap down so it's touching the top of the bread, and chill for 8 to 24 hours. You can place a book on top of the plastic wrap, if you'd like, to keep the bread submerged in the egg mixture. Preheat the oven to 350 degrees F. Remove the dish from the refrigerator and let stand at room temperature for 30 minutes. Bake on the middle rack for 35 to 40 minutes or until the edges are golden brown and puffed. Serve with a sprinkle of powdered sugar, and/or syrup, if desired. *If you do not wish to use Grand Marnier (a liqueur), you can add orange juice in its place. 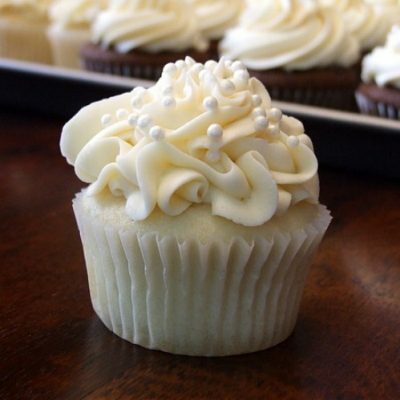 *Garnish each serving with a sprig of mint. I’ve been making this for years! When you serve it, you flip over the slice on the plate so the Carmelo bottom shows. Much prettier! An irresistible combo of two of my top comfort foods! 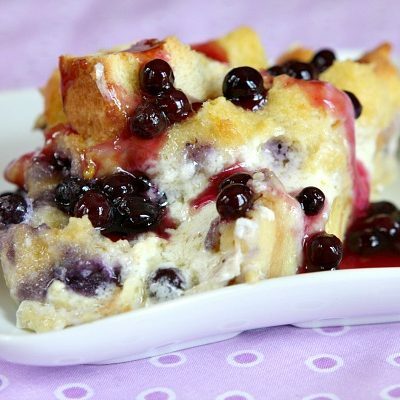 This is perfect for Christmas brunch! Looks really good! A couple of favorite dishes in one, I love this!